Climate Craziness of the week: Guardian's Damian Carrington 'glass half full' moment | Watts Up With That? This, is really quite something. We know the Guardian has lost just about all journalistic standards, but this one really takes the cake, especially from somebody who should know better. See the screen cap below. If indeed CO2 in Earth’s atmosphere was 500,000 parts per million, we’d have a big problem: we’d all be dead. The “blue fuzz” represents measured global CO2 increases in our modern times. January 22, 2014 in Carbon dioxide, Climate Craziness of the Week. What kills me is the almost unbelievable carelessness. I mean that literally, in the “they don’t seem to care” sense. I mourn for our culture. People can literally say anything…that is to say simply make things up without fear of penalty. The stunning lack of integrity evinced by the MSM is a much bigger problem than any largely beneficial global warming we might get. A society in which lies are not only tolerated by encouraged is on the road to unravelling. I have to agree w/ Les, I think this is the author continuing w/ his half full metaphor. But it is sloppy writing, and it’s a sloppy metaphor. Still, journalists are pretty well guaranteed to be the dullest bulb in the room, so my expectations were pretty well met. I’m somewhat pleased that they’ve recognized the impact of wasting money on climate nonsense at a time when the citizens are trapped in a moribund economy. The watermelons-vs-reality fight isn’t truly over in the EU any more than it is in the US. When California ditches AB32 we’ll know that the Eye of Caurbon is no longer upon Middle Earth. Perhaps he was advised by Michael Mann! Clearly Damian is not a man who understands anything about climate but why expect anything else from the Guardian. No matter how wrong the AGW promoters are proven to be, and no matter how correct the skeptical critique of AGw has proven to be, the AGW believers keep on banging the same drum. climateismydj – So what you’re referring to is Fiona Harvey’s breathlessly-parroted report on the IPCC’s “carbon budget”? Carrington’s engaging in a little bit of telephone-line journalism here. LOL. If only the solution were as simple as dropping a trinket in some volcano. To Les Johnson: you may be right, but language is what journalists are trained in. And the MSM is supposed to have fact checkers. I could be wrong, but it seems to me that the cause of this major blooper may be declining revenues in the MSM so that they can’t hire enough, or good enough, fact checkers, and possibly — possibly — that the writer actually didn’t understand what he was saying. OK, O Wise One, I followed the link and the “answer” to why such nonsense was published was “not staring [me] in the face”. In fact, I could not find it. Perhaps you would be so kind as to quote it. richardscourtney – in the Guardian piece Carrington links his “half full” comment to a piece from November of last year wherein Fiona Harvey plays climate-apostle and reports on an IPCC press release about a “carbon budget” and mankind having already burned half the carbon-laden substance that our minders believe we’re entitled to, complete with quotes from the usual miscreants like Stocker. But the most controversial finding of the report was its “carbon budget”. Participants told the Guardian this was the last part of the summary to be decided, and the subject of hours of heated discussions in the early hours of Friday morning. Some countries were concerned that including the numbers would have political repercussions. The scientists found that to hold warming to 2C, total emissions cannot exceed 1,000 gigatons of carbon. Yet by 2011, more than half of that total “allowance” – 531 gigatons – had already been emitted. I thought it was 350 as in 350.org, I also thought it was 400 or 450 but not 500ppm. Can someone explain the CO2′s temperature response graph again. I said in a recent post that increasing CO2 concentrations will have very little effect on world temperature, because CO2 was approaching saturation anyway. But I was told I was wrong. So could someone explain that CO2 temperature response graph really means. a political allocation of a “carbon budget”. Clearly, that equation is not obvious. The daft claim that the atmosphere is “half half full of carbon dioxide” is laughable, and I thought an attempt by climateismydj to explain the equation would be side-splittingly funny. That said, it will be interesting to see how the Grauniad now handles the error. Thankyou for your post to me at January 22, 2014 at 11:49 am. Yes, I read that in the link. But it does NOT say “the atmosphere right now is half full of carbon dioxide”. It describes a political allocation of a “carbon budget”. Please quote the part which explains how “the atmosphere right now is half full of carbon dioxide”. You said that would stare me in the face, but I still do not see that bit of what you quote. I have this picture stuck in my head of a person covered with soot and a mouth chuck full of black carbon – shades of Oliver Twist. …One of the most dangerous jobs was that of a chimney sweep. In Dickens’s novel, Oliver pleads with the magistrate not to apprentice him to a sweep. The work required very young or small boys, as their slight bodies could easily shin up the narrow, twisting chimneys. They were vulnerable to cancers caused by exposure to soot and often had accidents or suffered terrible burns. Some were choked by the soot pouring into their eyes and noses, and suffocated to death…. I have no doubt that this is the image that the alarmist want in my head. That first line was no mistake but a skillful bit of manipulation. Whether or not it will have little effect on global temperature depends on the value of climate sensitivity. Please use the WUWT Search facility for climate sensitivity and read the links. There is not space to explain all that here. For now, I make a comment on what I interpret you are really asking. Unless our understanding of radiative physics is wrong then increased greenhouse gases (GHGs, notably CO2) in the air must induce some additional warming all things being equal. But the climate system is constantly changing: “all things being equal” never happens. we do not know to what degree altered GHGs in the atmosphere have contributed to the natural global warming which is recovery from the Little Ice Age. What can be said is that to date there is no evidence for discernible global warming from human activities so any human contribution to observed global warming is trivial if it exists. It’s clumsy and (in that it leaves them open to criticism such as this) stupid, but it’s really only a bit of poetic licence and should not be read literally. The article introduces the idea of a glass being simultaneously half full and half empty. The reference to CO2 is meant to be read as saying that CO2 is the “half-full” part, and the “half-empty” part is the citizens’ pockets. It doesn’t mean that the atmosphere is literally half-full of CO2 any more than it means that the citizens’ pockets are literally half-empty of money. Anthony – may I suggest toning down your criticism a bit in light of this interpretation, while still making clear that the statement is stupid because of the risk of misinterpretation, especially by the non-scientific who will be unreasonably scared by the idea that the atmosphere really is half-full of CO2. The term “climate denier” was introduced by a linguist with ties to Al Gore. I’ve also noticed that many of the talking points that the CAGW industry uses seem (IMO) to be crafted language – meaning produced by someone with expertise in linguistics. I suspect this “half full” meme is something we going to see used widely by the pod people. Hmmm… So if my daughter tells me half her allowance is gone, I should assume that her bedroom is half filled with money? Mike Jonas – the one who credulously transcribed the metaphor as presented by the archbishops of the Intergovernmental Church of Climate Change was IPCC acolyte Fiona Harvey. Carrington then brought it across to his piece as an apparent statement of fact. It was no doubt clumsy, but more to the point it indicates that the Guardian’s ‘reporters’ (I will here use the scare quotes that Carrington should have used on ‘half full’, as they indicate that someone’s making a claim not necessarily grounded in fact) are prepared to send off to their editors anything the IPCC Sunday-school teacher tells them to without the slightest whiff of doubt. When one looks at the vast number of absurd comments made by the CAGW believers, we may someday realize that we are at the mid-point of these absurd comments. I suppose that would mean that the CAGW believers comments are now “half-vast”. Although some may say they have been such for a long time. “Climate denier” must apply to the alarmist cult, since they are following Mann’s claim that global temperatures did not change until the advent of the industrial revolution. But skeptics have always known that climate constantly changes. If that’s what he meant, then he is wrong. As we see, going to 520 ppmv will at most result in a negligible, unmeasurable change in T.
At both current and projected CO2 concentrations, there is nothing to be alarmed about. People forget that all the arm-waving is over CO2 rising from only 3 parts per 10,000 to 4 parts per 10,000. CO2 is still just a minor trace gas. The only effect from its rise has been an increase in agricultural production. Does this represent one half of a Carrington Event? Quick point: Damian Carrington is head of the Environment section at the Guardian. He’s the best they’ve got. If Damian Carrington has decided that the important scale for CO2 concentration is a political definition (not a physical definition) then the Guardian has officially classified AGW as a political story – not a story about the physical world. He is trying to be too cute, he even managed to misquote Fiona Harvey’s piece which said “more than half”, as it had to be “right now is half” to fit with the glass half full/empty metaphor. dbstealey – it’s a catechism and they’ve been practicing for ten years. As the Guardian goes full on crazy the sales go down the drain. ….. I’ve also noticed that many of the talking points that the CAGW industry uses seem (IMO) to be crafted language – meaning produced by someone with expertise in linguistics. Greenberg’s work for private sector organizations – including major corporations, trade associations and public interest organizations – focuses on managing change and reform…. Greenberg has conducted extensive research in Europe (particularly Great Britain, Germany and France), Central and South America (Argentina and Brazil), and Africa (South Africa). He specializes in research on globalization, international trade, corporate consolidation, technology and the Internet. For organizations, Greenberg has helped manage and frame a number of issues – including education, school financing, American identity, the economy, environmental regulation, international trade, managed care, biotechnology, copyrights, privacy and the Internet…. Greenberg has advised a broad range of political campaigns, including those of President Bill Clinton and Vice-President Al Gore, Senators Chris Dodd, Joe Lieberman and Jeff Bingaman; Governor Jim Florio and gubernatorial candidate, Andy Young; former Vice-President Walter Mondale; and a number of candidates for the U.S. Congress. For many years, he served as principal polling advisor to the Democratic National Committee. Greenberg works jointly on private sector projects with prominent Republican pollsters in the United States – including Fred Steeper (pollster to former President Bush), Bill McInturff and Linda DiVall – to bring a bi-partisan focus to public issues…. Greenberg provides strategic advice and research for leaders, companies, campaigns, and NGOs trying to advance their issues in tumultuous times. His political work has included serving as lead pollster and strategist to the campaigns of President Bill Clinton, British Prime Minister Tony Blair, Israeli Prime Minister Ehud Barak, Bolivian president Gonzalo Sanchez de Lozada, and South African president Nelson Mandela…. Dirk, you are learning the million man math that all alarmist use? yes, anyone can do it! Just say 10 is closer to a million than it is to zero! So just round it up! I’ve commented on this phenomenon in the past here. The climate alarmists these days are taking their cues from George Orwell’s Nineteen Eighty Four. They are rewriting history by altering past temperature data and are engaging in Orwellian newspeak by renaming CO2 as “carbon pollution” so as to demonize the source of CO2 and manipulate people’s perception of it. When engaging in a propaganda campaign, it is important to take advantage of the people’s lack of literacy in the given subject (in this case climatology), to rewrite history, and to control the means of disseminating information so that the truth does not get out (note the cooperation of the MSM with regards to climate alarmism). Orwell’s Big Brother is alive and well. Gail Combs, I don’t doubt you when you say “The Climate Change industry has hired Stan Greenburg”. However, I question the fearsome reputation, effectiveness and even significance of Stan Greenburg. If he was any good the alarmist blogs and the Guardian wouldn’t need to censor the wit and wisdom of their opponents. Any expert coach who’s only tactic is kick’em off the park will not have a long career. He is more optimistic than I am; I think the atmosphere is half-empty of carbon dioxide. It is impossible to calculate *half* of nothing. I believe what people really mean is that half of the material has been removed, and/or the container is half of the way to being emptied. .. They are just using the phrase “half empty” as a short form of the description when they are speaking and writing casually. It would not be a good idea to use the phrase in formal language where it is necessary to convey ideas with clarity and precision. Spiegel shifts CO2AGW around between Bojanowski, their science guy who is actually competent, and “Spiegel-Mitarbeiter”, some anonymous member of the old Spiegel collective (owning 51% of the paper). The latter stories are agitprop. There is no special rhythm between the shifts; seems to happen according to what political pressure must be excerted. You are asking about a couple of different things. The “saturation point” refers to the concept that above a certain level of CO2, there is no additional greenhouse effect. The kids at SkS actually do a fairly good “myth” debunking on this one – up to a point. They do not allow for differences in incoming solar wavelengths having any effect on absorbtion patterns, and their reliance of just the two measurements – at least in the write up. It is generally reported that the response to increasing CO2 concentrations is logarythmic, and not bounded by a saturation point, except extremely low and high concentrations – beyond consideration here. “Gail Combs, I don’t doubt you when you say “The Climate Change industry has hired Stan Greenburg”. The inventor of modern propaganda a.k.a PR, Eddie Bernays, was advisor of Woodrow Wilson on Wilson’s triumphant appearance at Versailles. The entire 20th century politics of the West have been shaped by Bernays and his successors. Rational debate is dead and the populace has been dumbed down to a half asleep state; deliberately. Your side of the political spectrum constantly redefines words and castigates anyone who uses a non-.politically correct term. You are master manipulators, and can thrive only through manipulation. Find the film “Century Of The Self”. Yes, I am aware of the work of the Freud family in advertising. I’ve seen that documentary (although the anecdote about liberation philosophy making a convent lesbian seems unsupported outside of that BBC film); it is excellently edited. Look, we disagree on a lot but I am not claiming that marketing is ineffective; on average it does work and I suspect we agree on that. I am claiming that the rise in suppression of opposing views in the Guardian, SkS and the rest is ineffective. And that has increased since this Stan Greenburg character has got on the money train. He doesn’t scare me. He’s the kind of enemy I like to have. Not ‘couple orders of magnitude’. Three. Three orders of magnitude. They out to stop presenting in ppm and use something like percent. I’m not sure the average person knows what a ppm is, or has any appreciation what-so-ever how small it is. On 15 June 2012, the Australian Communications and Media Authority (ACMA) found that Jones had breached the commercial radio code of practice in his reporting of environmental issues. This related to his claim that “human beings produce 0.001 per cent of carbon dioxide in the atmosphere”. ACMA chairman Chris Chapman said that the watchdog was not penalising the licensee of 2GB, but was working with it to improve procedures. On 18 October 2012 ACMA ordered Jones to undergo factual accuracy training and employ a fact-checker.Jones responded to these claims on 19 October 2012 claiming that he had mistakenly claimed the 0.001 to be of all “carbon dioxide in the atmosphere” where it should have been “all gases in the atmosphere” and that he had repeated the correct and undisputed figure of 3 percent numerous times later that week and offered a correction. Radio talk back host Alan Jones is in hot water again with the media watchdog after breaching the commercial radio code of practice by making unsubstantiated comments about power station closures and the salaries of climate change bureaucrats. 1/2 full of carbon dioxide ?? Three orders of magnitude off. Geeze they’re getting more accurate. How did that happen? The graph in the head post should be presented to the public in every possible media source as well as to every elected government official (I’m in the USA). The truth about the actual effect that an increase on atmospheric CO2 would/should sink the CAGW ship on the spot. Provide Spencer’s (hope I attribute this correctly) spaghetti graph of the models vs observed temperatures as an accompanying doc and the whole CAGW scam would/should be over. The entire scam has been sold as a result of a lack of knowledge presented to the public at large. The two graphs as noted above and sent to every journalist, educator, and politician known would certainly cause upheaval in the ranks. Just think about that for a minute. An eco activist writer continuing to spew out nonsense while walking through the office knowing that everyone from the sports to entertainment writers know his game is up. Just a thought off the top of my mind. CS#1 : “the atmosphere is half-full of CO2”. CS#2: “well that explains the lack of Antarctic sea ice”. “The atmosphere right now is half full of carbon dioxide”?!?! I seem to recall that Apollo 13’s crew had mental challenges when their capsule was way less than “half full of carbon dioxide”. Maybe these guys just need to open a window or get out of the office from time to time? Man it is a good idea to flash that CO2/temp curve frequently. By the looks of it, if the earth is at 15 C (288.15K), and we will only be able to get it to 289 with 750ppm. Thereafter we will take forever to get to 290K or 16.85K. No wonder these guys are pressing hard now. 100 years from now emissions would have to be slashed~ 90% to knock it down a meaningful amount (assuming away any possible thermostat control of warming). Talking about boiling seas to come and painting all the anomalies fiery colours over warming so far of less than a degree must have a more powerful word than exaggeration to describe it. Schneider would even blush I would think. Yeah, its good to look again and again at what all the fuss is really about. 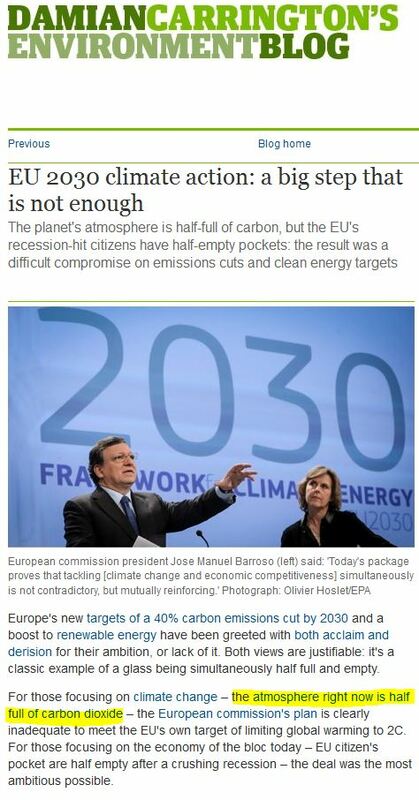 Is Barroso’s pose in the photo appropriate? You vill stop exhaling CO2 NOW….Undt you vill LIKE it! Think I’ve seen this script somewhere before…. Of course they did. More than a half is the most politically useful conclusion so that result was preordained. If they hadn’t been able to get the number to come out like that they wouldn’t have published the study. Thanks, but no you have not really explained this to me yet. Or at least I still don’t understand. We have a graph where increasing CO2 concentrations do not increase temperature. If the CO2 in the atmosphere is no longer increasing in temperature, with increasing CO2concentrations, then it cannot continue to increase the amount of long-wave radiation transmitted back to the ground. If the amount of long-wave radiation being returned from the atmosphere reaches a plateau, then so must the greenhouse effect of CO2 also reach a plateau. So from here on in, any further increase in CO2 in the atmosphere will have no effect on surface temperatures. Please tell me where my logic is failing. And if it is failing, then please could you explain what that graph really means. It occured to me that, even when using the twisted logic that the Groaniad uses to determine that the atmosphere is 1/2 full of CO2, that this isn’t that alarming. For example, my disk drive is half full. This is quite satisfactory. If is was 90% full I might be concerned, and consider cleaning up or expanding capacity, but half full is good. My car’s fuel tank is half full. That’s fine – I’ll think about refilling when it gets below a quarter. Just a guess. But you would think a journalist would be able to communicate the concept better. Warmist wonder they have communication problems. As the Brits would say, Carrington has “form” when it comes to “communication problems”; and, as others have noted, “sloppiness” in his writings and profound deficiencies in his “investigative” skills. For the benefit of others I provide this link to a WUWT article by David Archibald which provides explanations and graphs of what you are questioning. We each said the subject is too large for a full answer in this thread, and I suggested you read the links obtained by using the WUWT search for climate sensitivity so I suppose you have done that. Simply, atmospheric CO2 concentration is so high that it is near a saturation point but has not reached saturation. 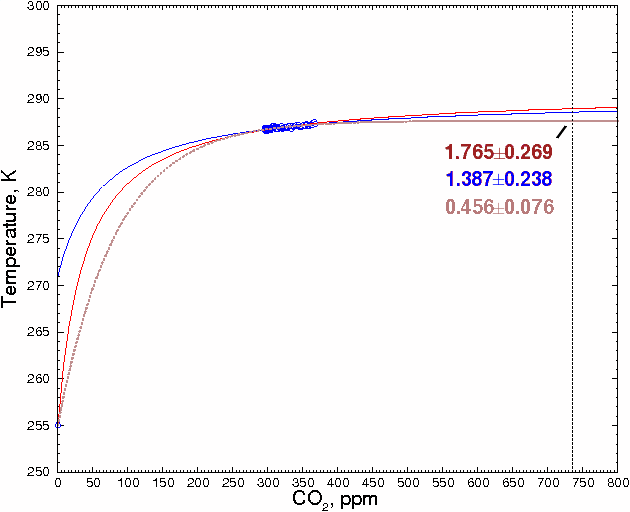 But the concentration is so near to saturation that effect of additional CO2 is small. The direct effect of doubling atmospheric CO2 concentration from its present level would only be ~1°C increase in Global Average Surface Temperature Anomaly (GASTA). This is so small an effect compared to natural climate variability that it would be indiscernible. However, that brings us to the issue of feedbacks. The increase to GASTA would alter phenomena in the climate system. And those alterations could also alter GASTA by enhancing the effect of increased CO2 (i.e. positive feedback) or reducing the effect of increased CO2 (i.e. negative feedback). (c) the climate sensitivity with negative feedbacks is an insignificant less than 1°C increase in GASTA from a doubling of atmospheric CO2 equivalent. I hope that is helpful and makes sufficient sense for you to follow up the matter elsewhere. There isn’t enough carbon on the planet to get to 10%, let alone 50%. But the Guardian is a pamphlet of the left, hence of and for people who mostly cannot count. This is just another example. He simply doesn’t know the difference between 400 per million and 400 per mille. Greenburg is one of the behind the scenes guys like Maurice Strong, another powerful man many people have not heard of. I mention him because he is completely over looked and he should not be. You may not have heard of him but he has been active behind the scenes in your country. The renowned polling guru and political strategist Stan Greenberg is playing a key behind-the-scenes role in Labour’s general election effort, PRWeek has learned. The man who helped Bill Clinton and Tony Blair get elected is providing high-level strategic communications advice in a number of seats that Labour is fighting hard to hold. Greenberg confirmed he was involved in Labour’s general election effort…. Greenberg is no light weight. Dr. Stan Greenberg has served as polling advisor to an array of special leaders, including President Bill Clinton and Vice President Al Gore, British Prime Minister Tony Blair, South African President Nelson Mandela, Israeli Prime Minister Ehud Barak, Bolivian President Gonzalo Sánchez de Lozada, Austrian Chancellor Alfred Gusenbauer and Romanian President Traian Basescu. He also wrote The Two Americas: Our Current Political Deadlock and How to Break It and Middle Class Dreams that put the spotlight on “Reagan Democrats.” Those insights made him the principal polling advisor to the Democratic Leadership Council during the formative years of change (1988-1994) for the Democratic Party…. Greenberg’s corporate clients include Boeing and Microsoft…. Pacific Standard The Science of Society: Why Are You So Smart, Stan Greenberg? Stan Greenberg used numbers and intelligence to help get Bill Clinton, Nelson Mandela, and other political figures elected. The CEO of Greenberg Quinlan Rosner and co-founder of Democracy Corps with James Carville and Bob Shrum came into the spotlight during the 1992 Presidential campaign when the Man From Hope took the nation by storm and defeated incumbent George Bush. Greenberg and his “War Room” cohorts fashioned the strategy using polling numbers and focus groups. Two decades later, polling is all the rage in political rhetoric, but Greenberg believes the second part of the equation is missing. There are too many numbers and too much noise, and not enough understanding…. The Miami University political science department was really good, and I went to Harvard afterward. I did a Ph.D. and got the top grade on the Ph.D. exam. I went to Yale after three years and started teaching there at a scarily young age. I was 25. I taught for 10 years, up to 1987. I started my company in 1980, but I was teaching at the same time. I was a Guggenheim Fellow…. I was at Harvard and MIT, and I had some of the best advisers in terms of people who were using advanced math and statistics in polling. At the time, that methodology was controversial within political science. I was being schooled in that. But I was also with people who were studying political economy and political philosophy. I was continually blending those things together…. Your tone is hardly conducive to a warm reception. It would have been far easier to say ‘yes’ you are perfectly correct. According to Archibald, a doubling of CO2 will only give 5 w/m2 of extra forcing, which a pee in the ocean. So the graph is much as i expected – increasing CO2 has little or no effect. I and Kevin Finnegan each went to the time trouble and effort of answering your technical question. It would have been far easier to say ‘yes’ you are perfectly correct. How dare you misrepresent me like that?! OK. I have learned. You are filed under ‘Offensive time waster’ so I will not provide you with technical information again. If the atmosphere was half full of carbon there would be no comments here.